With the arrival of spring and summer, it's time to think about giving your store merchandising a refreshing, dramatic new look. Attracting customers' attention is easier than you imagine, with the help of designer racks, displays and accessories that lend a creative flair to any product. One particularly stylish approach, especially if you cater to younger generations, is capitalizing on hot trends like steampunk or retrofuturism that combine a vintage and industrial feel. Using piping to display bracelets, handbags or necklaces – These are simple but eye-catching ways to shine the spotlight on your fashion merchandise. Featuring real industrial piping and dark wooden bases, display fixtures like these can truly complement your products. These are well-suited for faux vintage or antique creations. 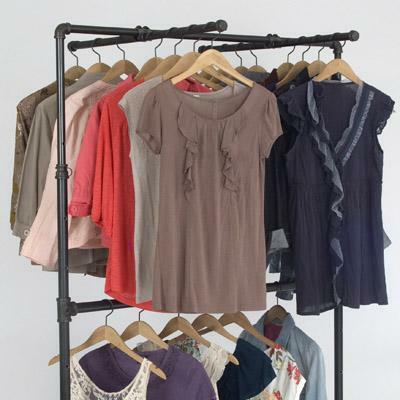 Natural and dark wood shelving – Give a touch of character and authenticity to folded apparel or other sale items. Sturdy and durable, with a natural or reclaimed look, wood shelves work well with other piping fixtures, allowing you to build one-of-a-kind wall systems that are uniquely yours, whatever your space or particular display needs. Put it in the basket – Using chrome look baskets combined with hanger and shelving units is another great example of how "old" can become stylishly "new." Strong but "see-through" in a different way, baskets invite shoppers to pick through loose merchandise items like gloves, flip flops, Koosh balls or a variety of other small products. Their casual, retro look hearkens back to days of bicycle baskets and supermarket shopping carts, connecting past with present and future. Piping "hot" display tables – Not your average shop table! Constructed with industrial piping for legs and framing, these tables even boast natural weld marks on the metal. By using out-of-the-ordinary tables, you can give a modern urban or rustic feel to your tabletop displays. Square and rectangular styles are available, plus a showcase version that offers added 2-in-1 versatility, since the top detaches for use as a separate, secure display case that calls extra attention to special merchandise. Spread the word with sign holders – Got racks? Add instant signs with an acrylic sign holder that features a raw steel finish metal channel, and is designed with a C clamp for use with round, square or rectangular tubing. You can also choose either a sign holder with a natural wood base or a small easel-type, tabletop sign holder. All of these easily complement industrial piping fixture displays. They're great for product details, sale signs, promotional signage or store information. 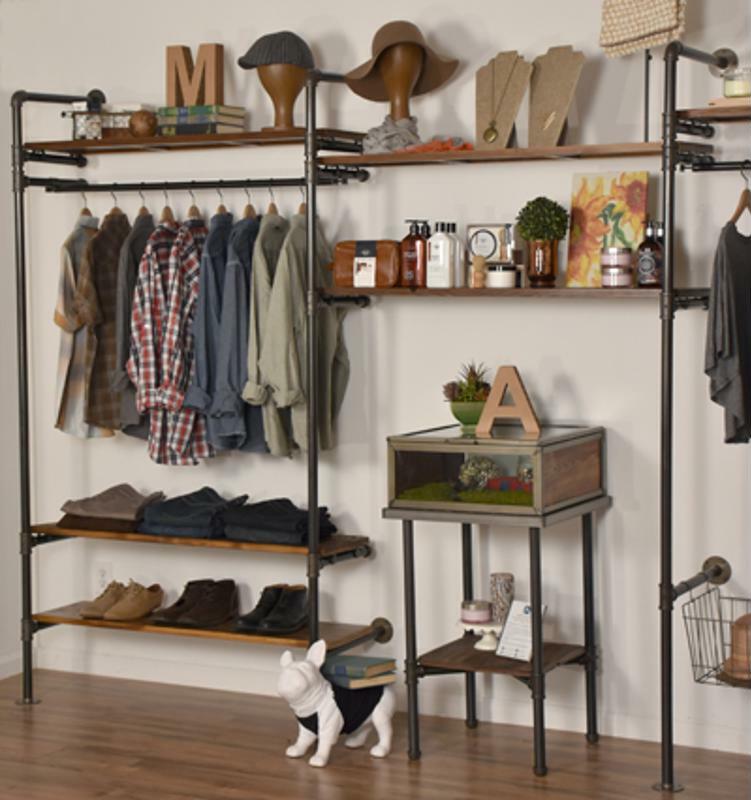 Bars, hang rails and wall hooks – If you're creating a distinctive store environment using industrial piping and other natural or eco-friendly materials, there are a wide range of connecting and accessory items to round out the decor theme. Whether it's a wall hook with authentic curved joints and flanges, or straight pipe lengths serving as outriggers, bars and hang rails, these display fixtures are both sturdy and stylish, giving the appearance of reclaimed, recycled plumbing hardware. When customers walk into your store, they'll immediately know by the look you've created that this is a place where they can truly feel "at home." Great for home decor, too! Many of these vintage industrial piping and shelving units would make a fashionable addition to your home decor as well. Just picture them in your living room, closets, office or garage!